Where is the Fortnite Blockbuster week 6 Battle Pass tier? This new challenge type gives players an extra easter egg hunt to embark upon every week, which can only be accessed if you have ticked off all of week 6’s Battle Pass challenges. 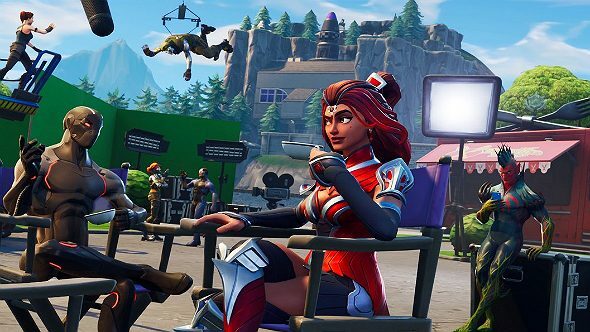 Completing every easy and hard week 6 challenge will grant you a new, Season 4-themed loading screen, and secreted away in the background of every Blockbuster challenge loading screen – often hiding in plain sight – is a clue for where you can find a free Battle Pass tier. Fortnite Blockbuster week 6 boasts plenty of variation in terms of its challenges and might take a bit more time than the previous week’s challenges, so prep yourself for a bit of a slog in order to get the week 6 loading screen. This was actually leaked a couple of weeks ago, so we’ve had plenty of time to track down the free week 6 Battle Pass tier. Related: here are the best building games on PC. The week 6 loading screen shows the full cast of heroes and villains hanging around a film set between the supervillain’s lair and Snobby Shores, drinking tea and being civil. But where’s the Battle Pass tier? Train your eyes on the top of the red Fork Knife truck in the background and you should spy a translucent Battle Star. If you’re a regular Fortnite player then you’ll know that the only Fork Knife truck is in Greasy Grove, so head there once you’ve unlocked the week 6 loading screen to grab your free Battle Pass tier. Below you’ll see the Blockbuster week 6 loading screen with the free Battle pass tier circled. 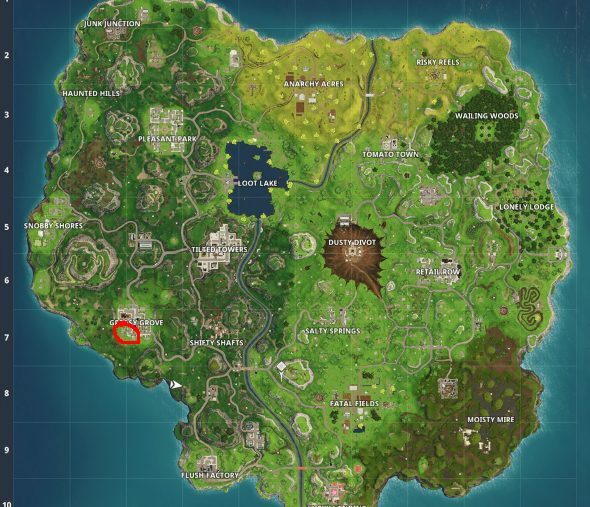 And here’s the location of the Greasy Grove Fork Knife truck. Greasy Grove should be pretty busy thanks to the week 6 search between challenge being located there, too. You’d be wise to leave these two challenges until last as that way you can grab the search between Battle Star and the hidden Battle Star during the same drop. One step closer to tha tier 100 Omega skin.